WP Domain Checker is a WordPress plugin which allow you easily to check domain name availability from your wordpress site. You can check or search for any generic top-level domains (gTLD) or country-code top-level domains (ccTLD). WP Domain Checker is made with AJAX and easily to use with Shortcode or Widget. Take a moment to review server requirements before installation, or you may encounter issues when using WP Domain Checker. Once you purchase WP Domain Checker, you will be able to download the ZIP file from CodeCanyon, containing the current version.Download it to your computer and unzip it. You will get a folder with the plugin name – ‘WP-Domain-Checker‘. Option 1 (easier) open your WordPress admin panel, go to Plugins -> Add new -> Upload and choose the wp-domain-checker.zip file that you downloaded from CodeCanyon. Option 2 (if first one doesn’t work) open your WordPress installation folder in some FTP manager (CyberDuck, FileZilla, Total Commander, or any other), go to wp-content/plugins/ and upload the folder that you unzipped in previous step. In your WordPress admin panel go to Plugins, find WP Domain Checker and click “Activate”. Voila, plugin installed! This plugin can install WordPress themes and plugins purchased from ThemeForest & CodeCanyon by connecting with the Envato Market API using a secure OAuth personal token. Once your themes & plugins are installed WordPress will periodically check for updates, so keeping your items up to date is as simple as a few clicks. 4. Go to WP-admin panel, open Plugins section. 5. Deactivate WP Domain Checker, and then activate it again. You can easily use shortcode [wpdomainchecker] to show domain name checker form in your page or post. width Change search box width. item_id Integrated to specific product ID. size Change search box size (small or large). Site Key & Secret Key required. allowed_tld Allow only specific tld to be check. Separate by comma for each extension. for multiple checker for multiple product WooCommerce you can add item_id in the shortcode. if you not include item_id in the shortcode, default product ID in the settings will used. Setup WP Domain Checker for Widget is very simple. Go to Widget section under Appearance in your admin panel and find WP Domain Checker Widget like screenshoot below. Just add the widget to sidebar or other place whenever you want. Like shortcode, with widget you can set input size and button text. Whois button will show while domain not available. First, you must create new page to whois page, you can create new page with whatever title you want. eg: “Whois” or “Whois Domain”. Make sure this is page not post. Then, put shortcode [wpdomainwhois] in the page you create before. 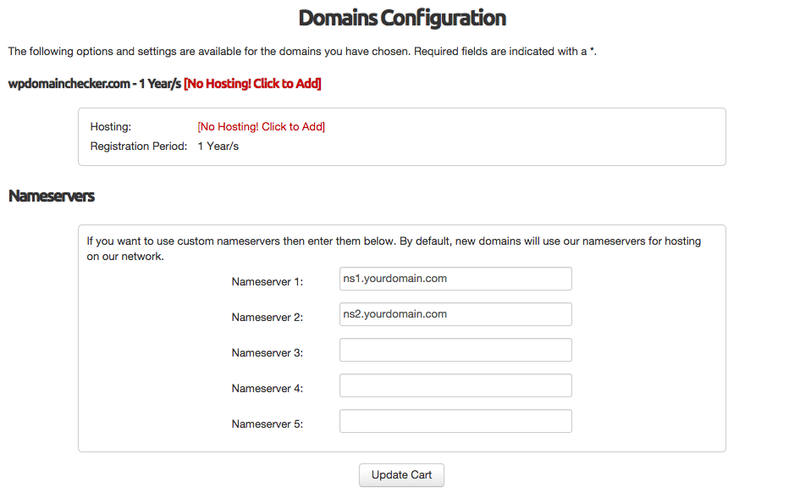 And then, select page you created before from WP Domain Checker Options section. Select disable if don’t want to show it. Please note, you only can integrated with one of them. So if you want to use WHMCS Integration, you can’t use Woocommerce or Custom Link. If you want to integration with your WHMCS, just select Integration with WHMCS. A button will appear when domain is available, and if user click the button, user will redirect to your whmcs domain configuration. Domain will automatically added to cart. Also, input your full url where WHMCS installed. Please include the “http://” like screenshoot below. If you want to integration with your Woocommerce, just select Integration with Woocommerce. A button will appear when domain is available, and if user click the button, user will redirect to your cart. Product with domain in meta will automatically added to cart. If you not include item_id parameter in the shortcode, default product ID in the settings will used. * Don’t forget to enable Redirect to the cart page after successful addition in your woocommerce settings. Since v2.6, you can set custom pricing for each TLD, if you don’t set the price for the TLD, the default product price is used. If you don’t want to use WHMCS or Woocommerce, you can use Custom Link. You can use this custom link for affiliate link or whatever link you want. fill the button text. eg: “Order” or “Purchase Now”. Also, to disable integration, just select integration with disable. Protect your domain checker from spam and abuse while letting real people pass through with ease. Click on ReCaptcha tab, and fill your ReCaptcha Site Key and Secret Key and save. Leave it blank to allow all extensions. Actually, there is no Transfer Domain function in WP Domain Checker, but there is an alternative to achieve this. You can transform Whois Button into Transfer Domain button that linked to Woocommerce add to cart, WHMCS add to cart or external link. On Whois Page option select Custom URL. *For Woocommerce add to cart, make sure you enable WDC in your Product data.